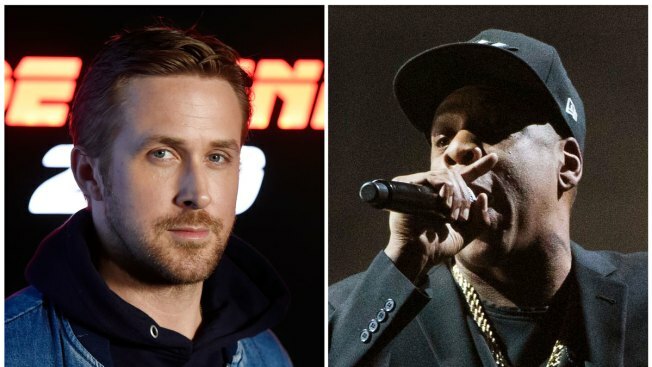 This combination photo shows Ryan Gosling at CinemaCon 2017 on March 27, 2017, in Las Vegas, left, and Jay-Z performing at a campaign rally for Democratic presidential candidate Hillary Clinton in Cleveland on Nov. 4, 2016. "Saturday Night Live" kicks off its new season with Ryan Gosling as host, Jay-Z as the musical guest — and pretty likely some jokes at the expense of the White House. The sketch comedy show starts up again Saturday and is hoping to build off one of its most-watched seasons in more than two decades thanks to Alec Baldwin's turn as President Donald Trump and Melissa McCarthy's appearances as former White House press secretary Sean Spicer. Both actors recently won Emmys for their work, as did Kate McKinnon, who played Hillary Clinton on the show. Baldwin tweeted a photo of himself as Trump prior to the show. The 90-minute show is now entering its 43rd season. It has grown so popular that it spun off the half-hour "Saturday Night Live Weekend Update Summer Edition" while the main show was on break.